Stranded on a remote, deserted island by his arch enemies, Sabretooth and Magneto, Marvel Comics' Wolverine must fight the battle of his life. Super-human powers, including regenerative healing abilities, an indestructible Adamantium skeleton and retractable razor sharp claws that slice through anything, make Wolverine a terrifying adversary... but has he finally met his match? 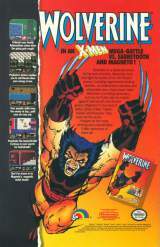 Lead Wolverine in this world-class struggle against Sabretooth and the evil genius, Magneto. In the heat of battle, fellow X-Men Havok, Jubilee and Psylocke come to your side helping even out the score. 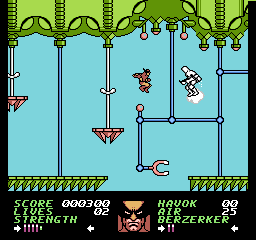 To survive, you must complete 9 missions, including The Battle for the Skies, Trial by Fire, Trial by Water, The Dungeon of Traps, and The Land of Nightmares, until, at long last, you face your ultimate foes. Prepare for the most exciting and unpredictable X-Men adventure of them all! Released in October 1991 in the USA.